I worked with Peggy by editing this book. 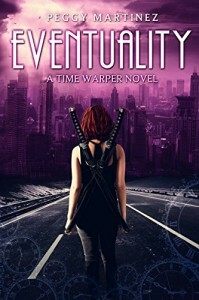 Eventuality is one of the best books I've read this year - definitely in my top 5 favorites for 2014! Sage's journal entries sprinkled throughout allow us an in depth peak into her inner turmoil and emotions. I'm totally in love with Lucio, a new character in this series, and I think he will tug on your heartstrings as well. Peggy writes her characters so that their emotions are almost palpable. It's a beautiful thing to feel like you truly know a character and to feel his/her pain, sorrow, elation, and love. I have two favorite scenes, both of which happen to be in the fae realm. What a beautiful, magical place! Peggy created a world I could see, feel, hear, smell, and taste in my imagination, and I want to visit and experience the magic for myself. Perfectly paced with magical characters, combined with a perfect blend of supernatural and time travel, makes this a must read!